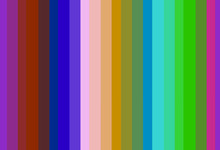 The colour bars ordinarily form a constant test signal image that is used to calibrate video equipment. Here the configuration of the seven vertical stripes continually shifts. The rapid pace with which the piece cuts produces different kinds of colour mixing, and in the video's flickering the phased fields of stripes appear to dart in all sorts of directions.